Railpictures.ca - Doug Page Photo: In a raging snow storm, CN C630m units 2001 and 2008 lead a westbound freight under the Plains Road bridge and into Bayview. Note the location of the horns and behind the cab on the engineer’s side; the 2001 and 2000 were also the only CN C630m units with delivered with dynamic brakes. | Railpictures.ca – Canadian Railway Photography – photographie ferroviaire Canadienne. 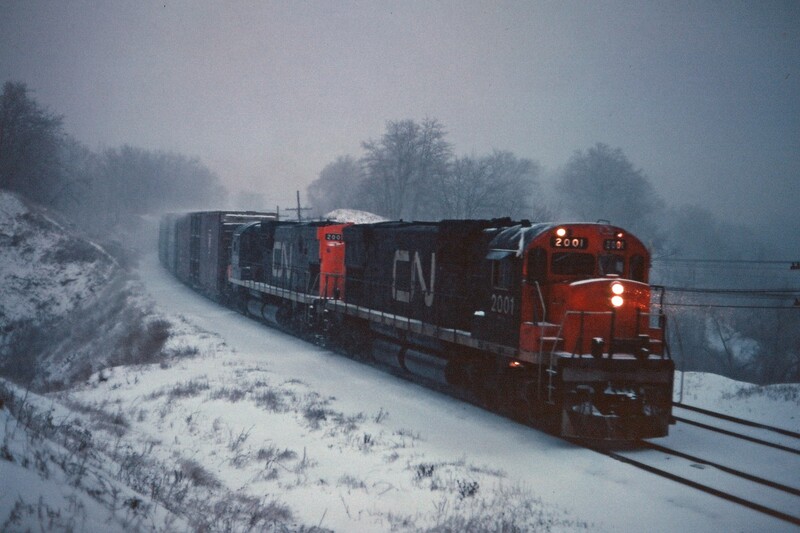 Caption: In a raging snow storm, CN C630m units 2001 and 2008 lead a westbound freight under the Plains Road bridge and into Bayview. Note the location of the horns and behind the cab on the engineer's side; the 2001 and 2000 were also the only CN C630m units with delivered with dynamic brakes.